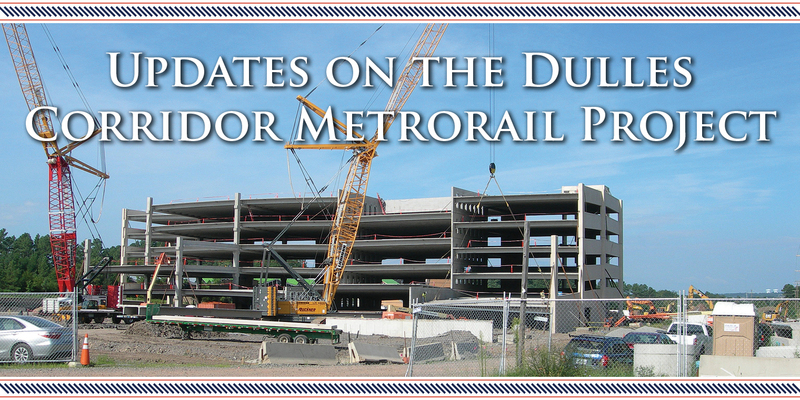 Work is progressing rapidly at Herndon Station, where work on the canopy is nearly complete. 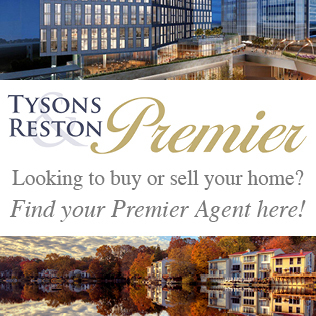 Recently, the ramp from the Dulles Toll Road to Fairfax County Parkway was reopened after a lengthy closure to allow project work in the area around the Herndon-Monroe Park and Ride bus bays. The south pavilion for the station will be located nearby. Virginia Deputy Sec. of Transportation Nicholas Donohue, MWAA President and CEO Jack Potter, Dulles Corridor Metrorail Project Construction Manager John Kearney, Dulles Metro Executive Vice President Charles Stark and Virginia Secretary of Transportation Shannon Valentine toured the Phase 2 of the Silver Line project in early May. 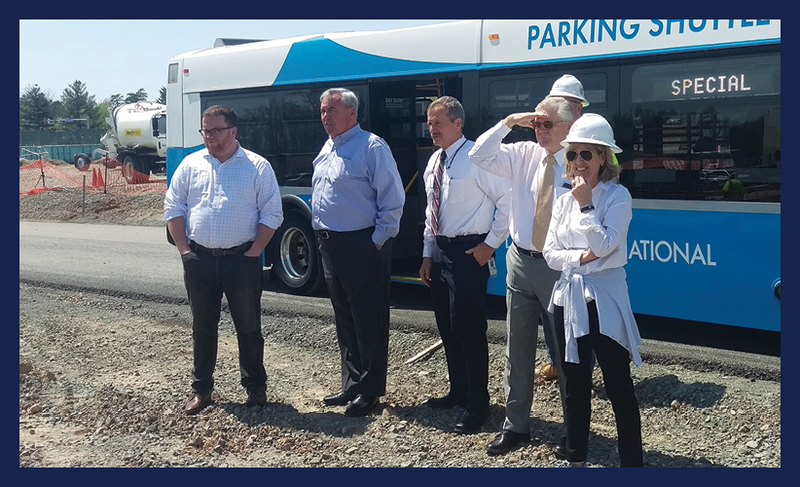 Virginia Secretary of Transportation Shannon Valentine joined project officials for a tour of the Silver Line Phase 2 in May. 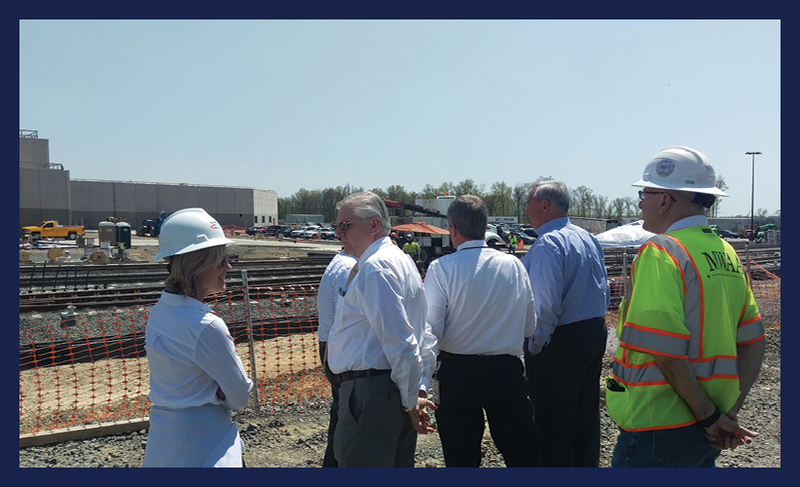 Here the group has stopped to take a look at the Rail Yard and Maintenance Facility under construction on Dulles International Airport property along Route 606 in Loudoun County. 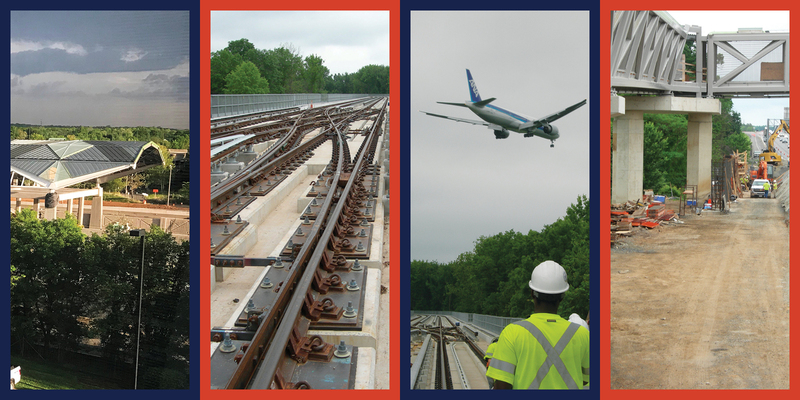 Much of the track work on the yard leads, the tracks that join the Silver Line Phase 2 to the nearby Rail Yard and Maintenance Facility on Dulles Airport property along Route 606, has been complete. 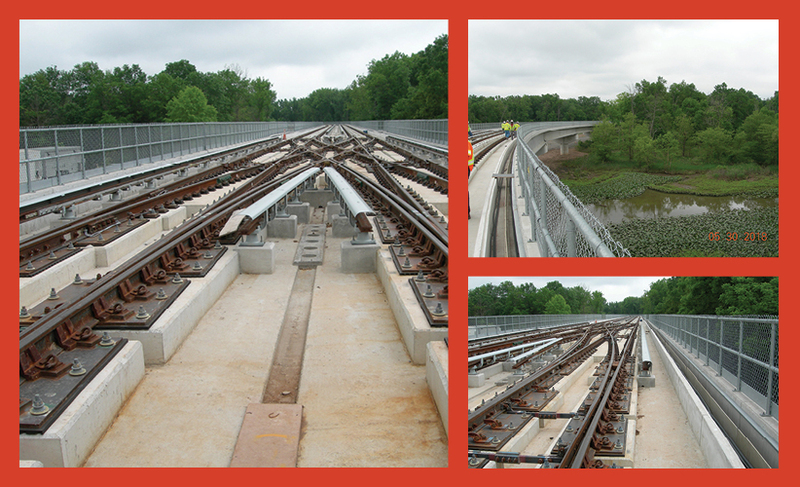 While one photo shows straight lines of track along the aerial guideway, the other photos show the beauty and complexity of a double crossover along the tracks. A double crossover permits moving in either direction to switch to the other track. 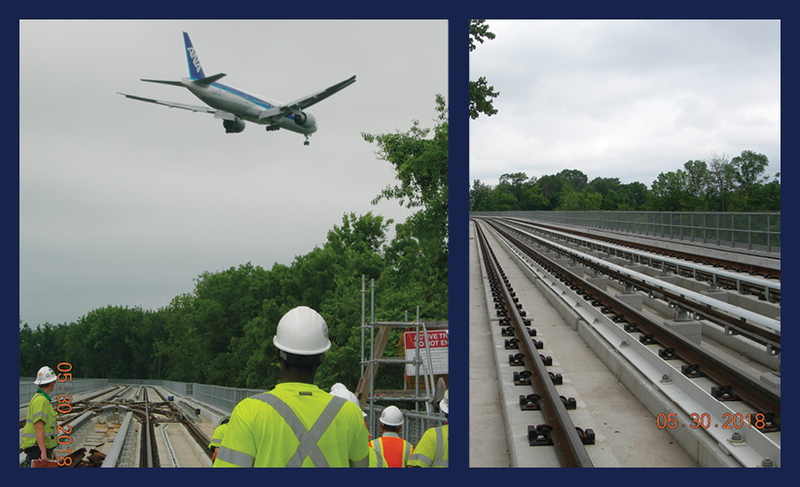 The tracks also had to pass over Horsepen Pond on Dulles Airport Property. 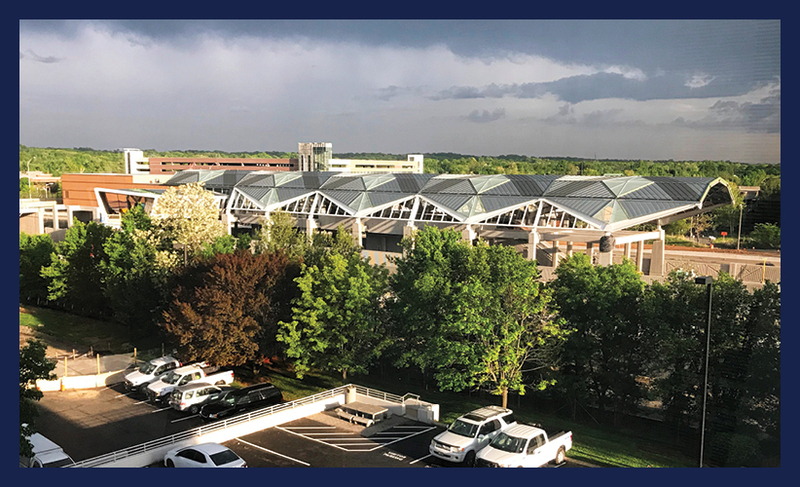 Taken at the yard leads on Dulles International Airport property, this photo demonstrates the proximity of the Silver Line to the airport. What’s going on down there? 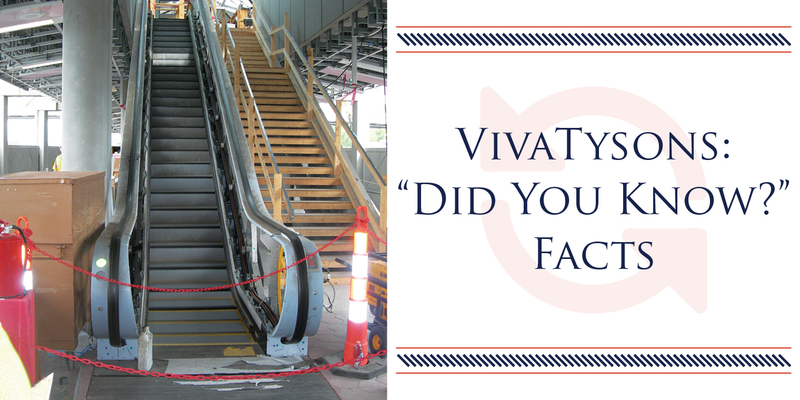 Commuters traveling along the Dulles Toll Road see construction cones and jersey barriers daily, but they do not always see the work that is going on just beyond those barriers. 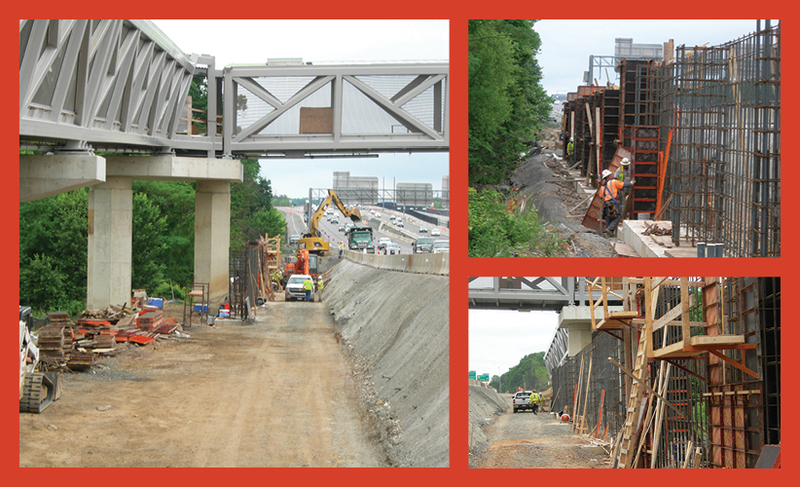 These photos demonstrate the proximity of rail-related work to the toll road. These photos, taken near the future Innovation Center Station north pavilion, show the installation of a soundwall between the toll road and a nearby stream. The work is taking place just below the pedestrian bridge leading from the pavilion.